Biking on the Asian side of Istanbul. Photo by bicyclemark. Last year, Turkey and the Netherlands celebrated 400 years of diplomatic relations, established between Sultan Ahmed I and Maurice, Prince of Orange, in 1612. In 1600, there were around 460,000 inhabitants living in Istanbul. There are upwards of 13.8 million in Istanbul today, putting pressure on the city, its inhabitants, city planners and preservationists to make better use of limited space, and implement more people-centric solutions for the benefit of the city’s two greatest assets: its people and its history. Through peer-to-peer collaboration and best-practice sharing, BikeLab Istanbul, a new project undertaken by EMBARQ Türkiye, the association dedicated to sustainable transportation in Turkey, in partnership with a Dutch consortium of six urban design companies, with YARD 9, and the Netherlands’ Royal Consulate General, is working to make Istanbul’s historic traffic woes a thing of the past. Onno Kervers, Consul General for the Netherlands in Istanbul, happens to be a cyclist. Kervers says that the Dutch Consulate was “ready on day one” to help bring famous Dutch cycling expertise to help turn Istanbul into a bike-friendly city, that uses bikes as another legitimate means of urban transport. Featured in a February 2013 article in Time Out Istanbul, BikeLab Istanbul was launched in a December 2012 workshop at Salt Galata, Istanbul. Attended by sixty guests, including representatives from the Dutch Cycling Embassy board, the Life with Bikes Association, and the Turkish Bikers’ Association, the workshop brought Turkish and Dutch experts together, along with urban transport stakeholders to discuss topics across the transportation space: bicycle safety, bike-pedestrian-transit infrastructure integration, and the fostering of a bike culture in the 8,500-year-old city. Participants shared examples of successful bike projects and bike lane designs from the Netherlands. Consul Kervers highlighted that the BikeLab project presents cycling as not only a mobility solution, but also as a way to take cars off the road, reducing Istanbul’s famed traffic congestion. Addressing the absence of an ingrained commuter cycling culture in the city is one of BikeLab Istanbul’s greatest challenges. Often, a hard-fought step forward is replaced by two steps backward from automobile drivers resistant to change. 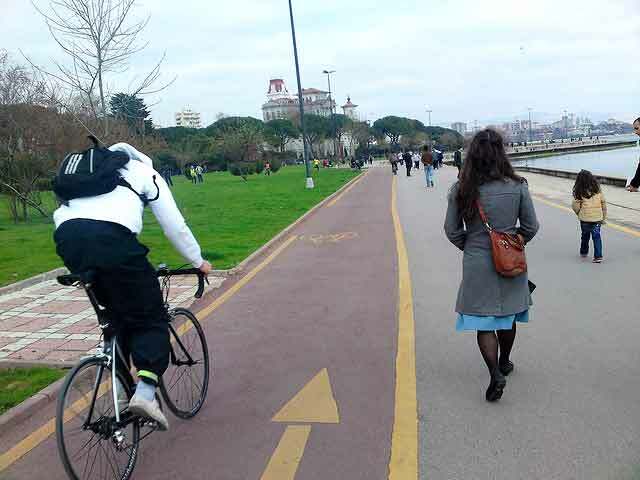 In November of 2012, cycling lanes were installed on Bagdat Caddesi, a 14-kilometer main thoroughfare on the Asian side of Istanbul, along the Marmara Sea. Yet, only a month later, due to opposition from drivers, the city removed the lanes in December 2012. “Bicycles are usually seen as the vehicle of the poor or the hobby of the rich,” observes Murat Suyabatmaz, president of the Turkish Cyclists Association, in the February 2013 TimeOut Istanbul piece. Meanwhile, automobile emissions are taking a costly toll on the preservation of the Historic Peninsula’s iconic attractions. BikeLab Istanbul seeks to facilitate the development of a cycling culture in Istanbul, through a number of different approaches. Normalizing cycling as a transport option for city residents has been identified as key in this process, and in addition to hosting workshops, BikeLab Istanbul seeks to reach people through promotion of cycling in mainstream media and television shows, and in particular, envisions capitalizing on Turkey’s robust sports culture to introduce biking to sports fans through a Tour de France-type racing event. BikeLab project partners also see a great deal of potential for bicycle integration at Kabataş, a bustling transportation hub for ferry boats, buses, light-rail, and funicular on the European side of the Bosphorus strait. BikeLab also would like to reach out to Istanbul’s youth and next generations of cyclists through education seminars on bike safety and the benefits of integrating biking into one’s lifestyle. The December workshop helped catalyze the planning and development of solid solutions to turn Istanbul into a biking city, inspiring further collaboration between Dutch and Turkish experts, the Istanbul Municipality, Istanbul Electricity, Tramway and Tunnel General Management (Public Bus Authority in Istanbul), and representatives from NGOs. Within the scope of the project, a number of events will take place in the coming year. EMBARQ Turkey and YARD 9 will conduct activities to encourage the use of bicycles as a means of transportation, through creative ideas and designs. Further workshops will be organized to design “safe and user oriented” bicycle lanes, following which will be the pilot implementation of prepared bicycle lane designs. What better way to honor a 400-year diplomatic milestone than to help Istanbul reclaim and preserve its ancient identity and make urban life healthier, safer, and more enjoyable by bringing in some Dutch inspiration?